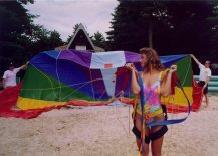 Made in the USA, the para-sail is a parachute that goes up! It is designed to be towed behind a boat or 4-wheel drive vehicle. The passenger snaps into the para-sail's comfortable harness, signals the driver of the tow vehicle, takes a few steps -- and soars into the air! Depending on the length of the tow rope, your para-sail can carry you hundreds of feet into the sky. RIDE THE WIND under our para-sail and you'll never again be happy just being a "landlubber." Grin to the thrill -- and the beauty -- of soaring hundreds of feet above your favorite lake, river or ocean. The colorful para-sail sparkles overhead while you enjoy a birds eye view in a peaceful and serene world. The ride is breathtaking and thoroughly enjoyable. The para-sail is stable so the passenger enjoys the ride without having to steer. And landings are easy: the tow vehicle slows down and the rider is gently lowered to earth. The para-sail has been popular at resorts for years. Now weekend sportsmen are discovering that towing the para-sail is as easy as it is exciting. Flying the para-sail is an aerial adventure that the whole family will enjoy. Get a para-sail from Power-Sail Corporation and ride the wind this weekend!